Modern applications are taking maximum advantage of the agility and flexibility of the cloud by moving away from monolithic architectures and instead using a set of distinct services, all working together. This includes foundational services offered by a cloud platform like Azure (Database, Storage, IoT, Compute, Serverless Functions, etc.) and application-specific services (inventory management, payment services, manufacturing processes, mobile experiences, etc.). In these new architectures, event-driven execution has become a foundational cornerstone. It replaces cumbersome polling for communication between services with a simple mechanism. These events could include IoT device signals, cloud provisioning notifications, storage blob events, or even custom scenarios such as new employees being added to HR systems. Reacting to such events efficiently and reliably is critical in these new app paradigms. Today, I am excited to announce the general availability of Azure Event Grid, a fully managed event routing service that simplifies the development of event-based applications. Azure Event Grid is the first of its kind, enabling applications and services to subscribe to all the events they need to handle whether they come from Azure services or from other parts of the same application. These events are delivered through push semantics, simplifying your code and reducing your resource consumption. You no longer need to continuously poll for changes and you only pay per event. The service automatically scales dynamically to handle millions of events per second. Azure Event Grid provides multiple ways to react to these events including using Serverless offerings such as Azure Functions or Azure Logic Apps, using Azure Automation, or even custom web hooks for your code or 3rd party services. This means any service running anywhere can publish events and subscribe to reliable Azure Events. In the days since we announced public preview, we have seen many customers find innovative uses for Azure Event Grid and we’ve been blown away by all the great feedback from customers and the community. “One challenge we have had in the past is the initial ingest of a new customer’s existing assets, such as image and video files, as they start to use Adobe Experience Manager Managed Services. Some customers have hundreds of thousands of assets and the process could take days to compete. Adobe has now developed a process of horizontally scaling this ingest process using Microsoft Azure Event Grid and Event Hubs, dramatically reducing the time required to get new customers who use Azure on board. "Event Grid empowers Paycor to provide a unified experience to our customers, across the suite of our human capital management applications. It becomes the backbone for an event driven architecture, allowing each application to broadcast and receive events in a safe, reliable way. It solves many of the operational and scalability concerns that traditional pub-sub solutions cannot." - Anthony Your, Director of Architecture, Paycor, Inc.
Microsoft Devices supply chain team utilized Azure Event Grid as part of its serverless pipeline to optimize operations and reduce time to market. The details are described in this Microsoft supply chain serverless case study. 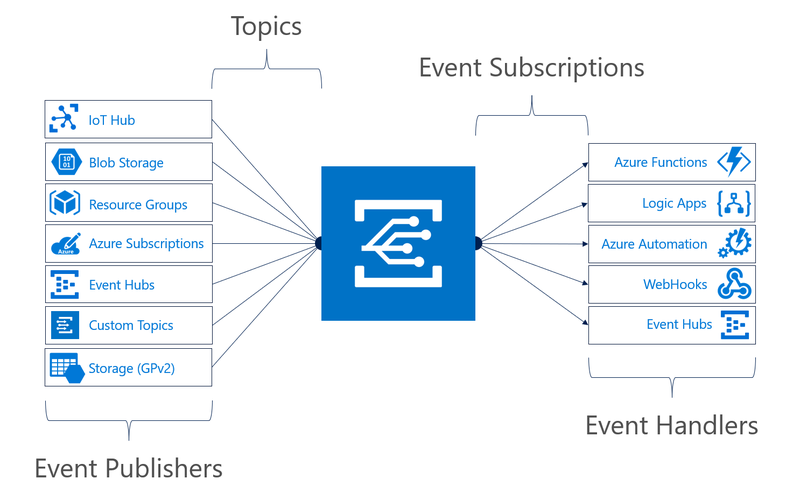 Richer scenarios enabled through integration with more services: Since preview, we have added General Purpose Storage and Azure IoT Hub as new event publishers and Azure Event Hubs as a new destination (great for event archival, streaming, and buffering of events). IoT Hub adds support for device lifecycle events such as device creation and device deletion which can then be handled in a serverless manner. These new integrations simplify the architecture and expand the possibilities for your applications whether they are in cloud or on-premises. Please see the full current list of Azure Event Grid service integrations for details and the region-wise availabilities. We will continue to add more services throughout the year. Availability in more regions: Azure Event Grid is globally available in the following regions: West US, East US, West US 2, East US 2, West Central US, Central US, West Europe, North Europe, Southeast Asia, and East Asia with more coming soon. Increased reliability and service level agreement (SLA): We now have a 24 hour retry policy with exponential back off for event delivery. We also offer an industry-leading 99.99% availability with a financially backed SLA for your production workloads. With today’s announcement, you can confidently build your business-critical applications to rely on Azure Event Grid. Better developer productivity: Today, we are also releasing new Event Grid SDKs to streamline development. Management SDKs are now available for Python, .Net, and Node.js with support for Go, Ruby, and Java coming soon. Publish SDK is now available for .Net with support for Python, Node.js, Go, Ruby, and Java coming soon. Additionally, we have now made it easier to consume events by simply fetching the JSON schema of all supported event types from our event schema store. This removes the burden of the subscriber to understand and de-serialize the events. With today’s GA, I think you will find that Azure Event Grid becomes a critical component in your serverless application. Go ahead, give it a try with this simple and fun Event Grid Quickstart. Remember, the first 100,000 events per month are on us! To learn more, please join us for our upcoming webinar on Tuesday, February 13, 2018. Register here: Building event-driven applications using serverless architectures.